Llamas are a South American camelid and the domesticated form of the guanaco which live in the Andian areas of Peru, Bolivia and Chile. Other members of the family include the larger Middle-Eastern or African camels and their smaller South American cousins, alpacas and vicuñas. Llamas were first introduced into this country, as were many exotic creatures, as a curiosity by the Victorians and since then have had peaks and troughs in popularity as pets and working animals. The seventies in particular saw a steep rise in interest and, although popularity may have waned slightly in present times, llamas are still widespread with individual ownership accounting for the vast majority of the 3000-4000 thought to be here today. With all the information so far you may be surprised to learn that llamas (and alpacas) are not currently required to be registered with DEFRA and are not subject to any of the movement paperwork or restrictions associated with other livestock. They are classified as pets predominantly due to the fact that they are not farmed for meat in this country. This means that, although you are encouraged to do so, you don’t even need to obtain a CPH number to keep these magnificent animals on your land. Llamas are not generally kept for the commercial production of either meat, milk or fibre so you may be wondering why you would keep them, other than as pets, at all. Some reasons we have eluded to earlier, but they have many characteristics that, while you may never make your fortune with llama produce, make them a worthwhile addition to any smallholding. As already mentioned, as well as being good grazers, llamas can be used to manage areas of land with a heavy covering of bracken or gorse, as well as overgrown hedgerows. As they have padded feet as opposed to hooves they are less destructive to land. 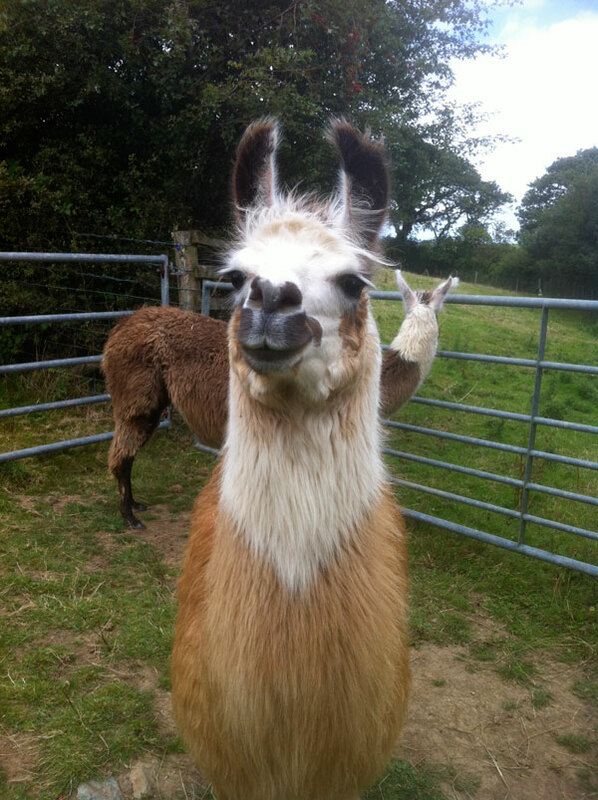 Llamas have long been used to protect sheep and poultry from fox attack. A gelded male is usually chosen for this purpose but females with the right disposition can also be used to good effect. Entire males, while a possibility, are more difficult to keep and should not be kept with sheep as they will try to mate the ewes which can be very dangerous or even fatal. Llamas are well adapted for life in the mountains and as such are very sure footed. They are also able to carry considerable loads of up to 25% of body weight for considerable distances so are great for trekking expeditions or as an addition to a natural farming system where they can move loads around your land efficiently and cost-effectively. This is facilitated by the fact that they are readily halter trained and very amenable to being led – again castrated males are especially suitable for this. 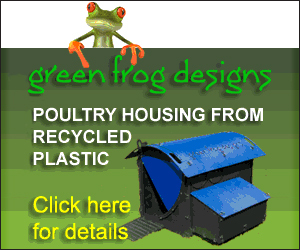 Their nutrient rich droppings can be put straight on the garden without burning plants or made into a liquid fertiliser ‘tea’ by mixing one part pellets with two parts water. Llama fibre is more hair than wool and can be variable in quality so if you wanted to use this by-product you should choose your animals with this specifically in mind. Llama fibre is often mixed with wool or other fibres to improve its quality and characteristics. Llamas are generally only sheared once every two to four years, if at all, so don’t expect to make a fortune from fibre products. Vicuña fibre by contrast is extremely fine and soft and its hollow stems make it a particularly good insulator. It is however, very hard to come by as it is harvested from wild animals and then only every three years or so. Talk to anyone who has experience of both sheep and llamas and they will tell you that they are infinitely easier to maintain. Firstly, as mentioned above, they don’t need shearing as often and, in fact, their coats will simply stop growing if left. There is also no need for dagging as the absence of lanolin in their coat means they don’t attract flies so readily and thus the incidence of fly strike in llamas, while not completely eradicated, is vastly reduced. 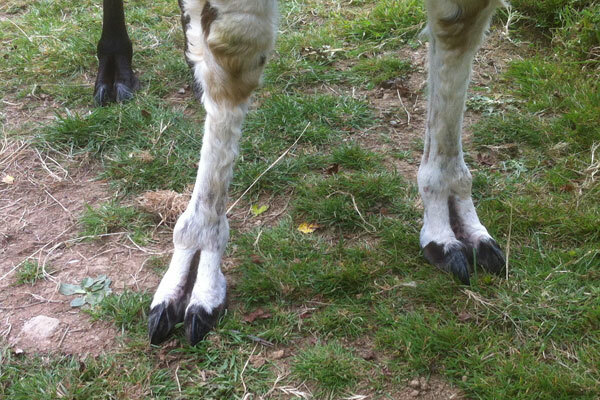 As they have leather like pads on the underside of their feet, as opposed to a cloven hoof, llamas don’t suffer with foot rot and the ‘toe nails’ will generally need less trimming than with sheep – sometimes as little as once a year. As with other animals, those with lighter coats may need more regular foot trimming and this can be done with the same shears as is used for sheep or goats. Other than that regular worming is the only other health routine required. Llamas will live quite happily on grass and if you have plenty of good quality pasture this will maintain them all year round with some additional hay during the winter months if grazing runs low. They will always be happy to take treats or forage hedgerows for variation and, although it shouldn’t strictly be necessary, you can supplement with sheep mix if required. The coat has fairly waterproof guard hairs and although llamas will stay out all year you should provide an adequate field shelter to guard against the most inclement weather and be prepared to bring them in if conditions become too extreme. Stocking density should be kept at around four llamas per acre but remember that as it is best to rotate them occasionally to reduce worm burden a minimum of two acres for four animals is recommended. Llamas can have very different personalities so, before buying, it is well worth visiting as many as you can before making your decision. Some will be better for guarding duties while others will prefer to trek or be better on a halter. Either way some traits may not be apparent until they have matured slightly so it could be worth going for a slightly older animal to get the exact characteristics you require. I addition to their other benefits Llamas also birth easily with intervention only very occasionally necessary. They have one baby, called a Cria, at a time (incidence of twins is almost unheard of) and, unlike sheep who can lamb any time, they always give birth during the day. Llamas can also fall pregnant at any time of year. Of course, no matter how hardy an animal, there will come a time when they will need professional medical treatment so you should ensure you have a suitable large animal vet in the vicinity should you need to call on their services in an emergency. It is not unusual for llamas to live for 20 years or more so they are not a short term project and it is worth the initial effort when choosing your animals. They are herd animals so a good breeder won’t sell you a single animal with most preferring them to go in groups of three or four unless you can prove that there are suitable companion animals already in place on your land. Look for a British Llama Society registered breeder who will be able to help you with your choice and should also be able to provide husbandry advice and any necessary training if required. Llama are generally very quiet and gentle, even affectionate, animals but they will react if they feel uncomfortable in any situation. Spitting is a trait displayed by all camelids but in llamas you will generally only see it when they are confined or feel their space is being invaded – you will hardly ever see this behaviour in the open field. You should only really stroke a llama gently on its neck, stay away from the head, and especially the ears, as they will get agitated and may possibly spit in such circumstances. Similarly don’t approach or surprise your animals from behind as this may also provoke a reaction or even a kick. When the ears go down your llama is assessing a situation it is not sure about. They will usually be up again very shortly but be aware of anything you’ve done to confuse or concern your animal. 1. A female llama sits down to mate. She will do this if ready but may spit at her suitor if already pregnant – a good test to tell if your female has been successfully mated. 2. Llamas are sometimes referred to as semi-ruminant as they have only three stomachs as opposed to the four that more recognisable ruminants such as cows and goats possess. 3. As being pack animals, in their native countries they are used for food and to make leather products. 5. The Incas prized Vicuña fibre so highly that only royalty could wear it – the death penalty faced anyone else caught in vicuña cloth. 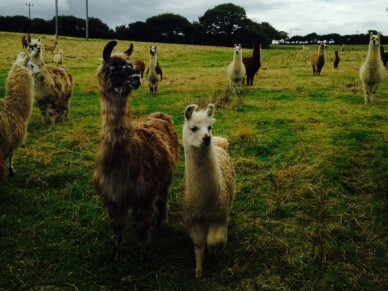 Tom Tripp runs Llama Lland from Penare Farm near Truro in Cornwall and currently has the largest herd in the country. 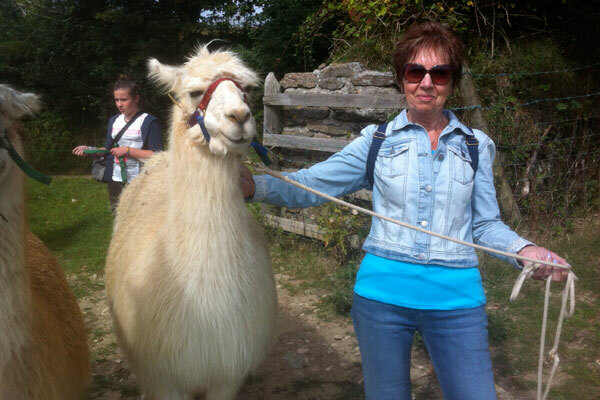 He is happy to provide advice or you can experience llamas hands on by booking on to one of his llama walking experiences. He also has the only herd of miniature llamas in Europe.